Are there any other family members with photos of Hollis? Also letters, newspaper clippings, anecdotes, etc? I can send responders a file attachment with about 150 pages of history, much of which post-dates Dunton's involvement. (Have a lobster dinner reward for the privilege of reading and citing the "lost" diary of Hiram Francis Abbott, Hollis' partner.) Was Abbott related to Hollis? The diary was in the possession of Thurston Cole, of Rumford Point, when he died in 1964." Hollis Cass Dunton was born in Etna, Maine (b. April 18, 1855 Etna, Maine d. August 4, 1928 North Anson, Maine, buried Carmel, Maine) . He was the son of Calvin Dunton and Sarah Tribou Dunton. In 1881, he married Annette Kimball and they had three children: Charles, Ezra, and Mary and lived in Rumford's "Virginia" neighborhood (Dot Dunton, personal communication, 2000). Hollis was a lumberman and helped form the Dunton Lumber Company. "When the building boom started at Rumford Falls the need for sawed lumber became great. Blanchard and Twitchell organized a company that flourished for a few years; while Albert Turgeon organized the Rumford Falls Lumber Company in the 'Virginia' section above the Falls. In October 1898, the Dunton Lumber Company purchased the Turgeon holdings and built an entirely new mill on the bank of the Androscoggin River. The corporation was organized with Waldo Pettingill as president, Hollis C. Dunton as Treasurer and general Manager, George Bisbee as Clerk and Pettingill, Dunton and Edwin Riley as Directors. (Martin, 1980)"
Family tradition holds that Hollis Dunton was an investor in the Dunton Silver mine, Hampden, Maine (Dot Dunton, personal communication, 1999). The Dunton Silver Mine was reorganized as the Consolidated Hampden Mine (Maine Mining Journal [MMJ], April 2, 1880), but the mine was generally advertised simply as the "Hampden Silver Mine". Hiram Dunton, of Hampden, was one of the principle organizers and George Dunton was superintendent of the Dunton (Hampden) Silver Mine (incorporated December, 1879)(MMJ, January 2, 1880). "The officers were Honorable Frederick M. Laughton, President; William H. Strickland, Vice President; Charles F. Bragg, Secretary; Charles E. Hill, Treasurer. The incorporators were Frederick M. Laughton, William Strickland, William T. Pearson, Eugene M. Hersey, William P. Hubbard, Charles R. Bragg, Norris E. Bragg, John P. Tucker, Thomas White, Clarence G. Bean, Charles H. Huckins, Charles D. Stanford, Gordon Stanford, Arthur R. Hopkins, Fred W. Ayer, Ezra L. Sterns, Fred S. Crosby, Hiram Dunton, Frank H. Clergue, and Charles E. Hill. The Dunton mine was on property owned by Hiram Dunton. There were seven distinct quartz veins. Other mines were the Silver Drift on Lyman Fowler land and the Lawrence mine on the Donald Thayer farm." "Hiram was the son of James Dunton a successful ship builder. Listed as a "carpenter" in a contemporary census. An entrepreneur in the best sense, he bought timber land and sold lumber to the cities being built on the east coast, then sold the land. Family tradition has it that he is responsible for Mt. Desert Island being a desert. Supposedly he bought the island, stripped it of timber and then sold it." (Phil Dunton, personal communication, 2000). On May 21, 1880, MMJ indicated of the Hampden (Dunton) Silver mine: "The shaft has now reached a vertical depth of 138 feet and the work is being prosecuted with vigor. Mr. Thomas Cahill, the well known superintendent. has taken charge of operations and in a brief time this promises to be the deepest shaft in the state." By October 8, 1880 (MMJ), the shaft had reached its target depth of 200 feet and a crosscut began to intersect the ore. By November 19, 1880 (MMJ), Cahill was replaced by "Dunton" as superintendent. The ore vein was thought to be 25 feet thick in the 200 foot level crosscut and was wider than the vein intersected by the 78 foot level crosscut. By December 10, 1880 (MMJ), the crosscut was 16 feet into the vein. By January 28, 1981, MMJ, the crosscut was 42 feet long. It was reported, February 11, 1881, (MMJ), a winze was 9 feet deep into the ore "in good looking quartz". Unfortunately, this report was the last ever made of the Hampden Consolidated Silver mine and only the Lawrence Silver Mine of Hampden received further notice of the many original mines of Hampden. The quartz vein was obviously very difficult to mine and was undoubtedly leaner in ore minerals than could be worked at a profit. The Hampden Silver mine is located just north of Route 202 and 9, southeast of Hammond Pond in Hampden (Thompson et al, 2000). Morrill and Hinckley (1959) indicate there were seven silver mines in Hampden. Of particular interest is the fact that Hiram Dunton married Loisa Pierce (b. November, 1842 Hampden, Me d. May 15, 1912, Hampden) and the ceremony was performed by Hannibal Hamlin, cousin to Augustus Hamlin (Phil Dunton, personal communication, 2000). Hollis Dunton was one of the founders of the Fraternal Order of Elks in Rumford and was a master of the Cora chapter of Masons near Rumford Point. Van King wrote his thesis in 1980 on the technical aspects of geology of the Dunton gem quarry and nearby mines: "Distribution of Alkali and Alkaline-earth Elements in a Newry, Maine Pematite". This is available through University Microfilms, Ann Arbor, Michigan. Van also wrote a brief history of mining along with descriptions of the crystals found along with numerous photographs of mines and crystals in "Newry, Maine: a Pegmatite Phosphate Locality" which appeared in Mineralogical Record, v. 6, p. 189-204 (1975). Additionally, Van described and photographed Dunton gem quarry crystals along with additional descriptions in "Mineralogy of Maine, volume 1" (1994) which is available and a much expanded history of the Newry mines along with other Maine mines. Van's email address is ANNWB2@aol.com. 1. Sandy Nile was Joseph Abbott Nile's brother. 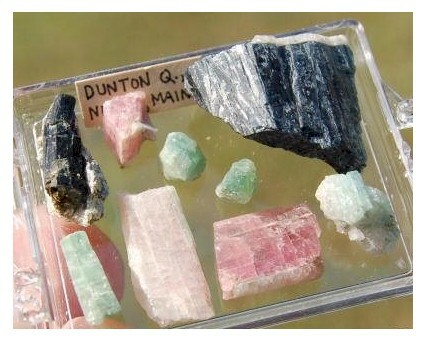 We purchased this small collection of tourmaline's from the Dunton Quarry. These were typical of what a person could collect from the mine's dumps in the 1980s. The collection includes pink (Rubelite), blue (Indicolite) and several shades of green Tourmaline. No gem rough just a little selection of location Tourmaline. 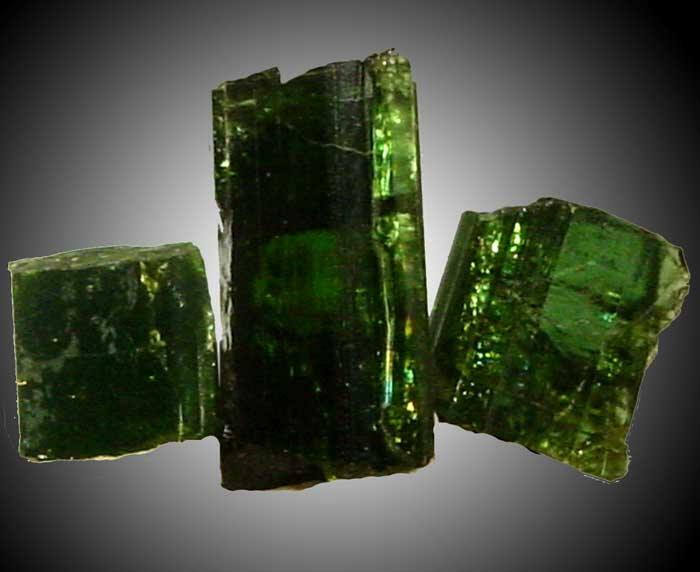 The largest Tourmaline is an Indicolite and it is 2.5 x 2.0 cm. This page was last Updated January 16, 2019 .